Students talk with Homewood seniors about the Civil Rights Movement. Check out the photo gallery below. 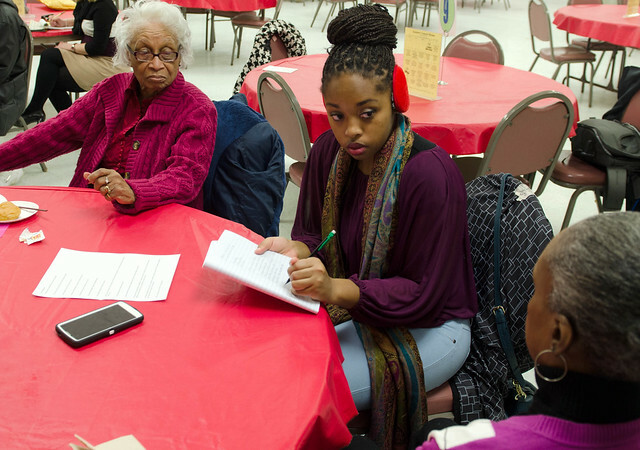 In honor of Martin Luther King, Jr. Day, Point Park students in the Honors Student Organization traveled to the Homewood Senior Center to learn about what life was like in Pittsburgh during the Civil Rights Movement - directly from people who experienced it. "I decided to go on the trip because it was something I had never done before. It was a unique experience to learn about history from those who experienced it first hand," remarked Colston Cooper, a senior civil engineering technology student. The students spent several hours conducting oral history interviews with the local seniors and getting their thoughts on social justice issues of today. These stories were then shared at the Jan. 22 "Speak Out Open Mic Night" event hosted by Point Park's Black Student Union. Laura Byko, junior journalism major and president-elect of the Honors Student Organization, helped organize the trip. "I think it's important to remember and chronicle history as it was, not with rosy-eyed nostalgia," she said. Reginald Tolliver told the students, "As a young child, I began to notice I was not treated the same as others. When I went to the store, white customers would be waited on before me." "I watched a friend of mine almost get shot," added senior Furman Johnson, who was 17 years old when Martin Luther King, Jr. was assassinated. "A major problem with our nation is that it has embraced a winner takes all mentality." "The seniors were virtual encyclopedias when it came to the history of their community, Homewood. I was surprised to learn how, in many ways, the history of Homewood, the MLK riots, the white flight and resulting segregation and the political and economic disinvestment, is a microcosm for the history of the U.S. over the past 50 years," explained Justin Karter, M.A. in journalism and mass communication alumnus, M.A. in clinical-community psychology student and graduate assistant for the Honors program. Senior Mike Vick inspired students with a variety of his original poems including "Let's Take a Look Back," "A Sign of the Times" and "Black History is American History." "Martin Luther King said we can all be great but the greatest thing we can be is caring toward each other," said Vick. Student leaders, faculty and staff commemorated the 50th Anniversary of the Selma to Montgomery marches at the Second Annual Martin Luther King, Jr. Leadership Luncheon hosted by the Office of Student Affairs. Attendees watched a powerful video on the marches and engaged in round-table discussions on the topic of civil disobedience. "We need to continue to be leaders moving forward and keep the conversations about civility going, not just at Point Park University but within our communities and beyond," said Keith Paylo, associate vice president of student affairs and dean of students. That evening, Point Park students were among those who participated in We Change Pittsburgh's "Mass March Against the Racist Wars at Home and Abroad," in which hundreds of people marched from Oakland to Downtown Pittsburgh in a demonstration for racial justice. In addition, more than 30 Point Park students will be going to the SouthSide Works Cinema to see "Selma," the movie chronicling the epic march by Dr. Martin Luther King, Jr. and his followers from Selma to Montgomery, Ala., which ultimately resulted in the Voting Rights Act of 1965.